The new Books & Books is almost up and running at 3409 Main Highway; they have been adding books every day. Lots of books. That whole section of the Grove is quite cozy and seems like its own little cottage industry. From the new Gigi restaurant to Panther Coffee and Poké 305 , along with Le Pain Quotidien and the bicycle store, it's like it's own little village inside our big village. Books & Books is not open yet, they plan a soft opening some time next week, but no date is set. You'll just be walking by one day and there they'll be - open for business! The shelves are full with books and are wall-to-wall, there is an upstairs and a downstairs. It feels so comfortable inside, one reason could be that the book shelves are their original shelves from their original store in Coral Gables - their first store! There is a little counter on the first floor which will serve beer, wine and soft drinks and eventually sandwiches. "We’re so pleased to have such wonderful neighbors and we hope to work very much in tandem with them. We will not have coffee, as there is the wonderful Panther Coffee right next to us and we hope we’ll see many customers browsing our store, while enjoying one of their marvelous coffees. As the space was once a wine bar, we are looking into that. That will probably come a bit later. 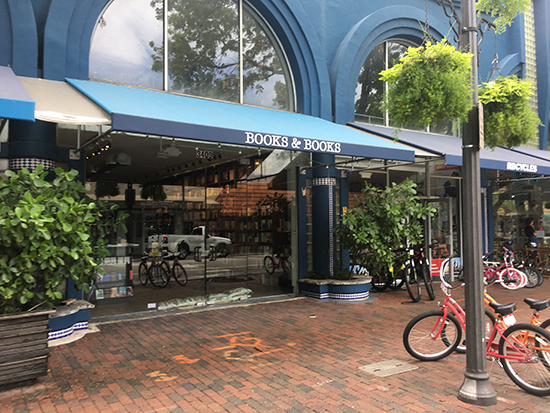 I’m hoping that we can successfully bring our brand of independent bookselling to this very iconic building in The Grove, a community that, as a Miami native, I’ve always revered," said Mitch Kaplan, owner of Books & Books. I think they are a great asset to the neighborhood, I know most of you feel the same way. Will they have beverage & food? In response to dog menu at Lulu's, that's pretty crazy. and dogs aren't supposed to eat potatoes. Must be restrictions against it.